As the middle class shrinks due to the widening rich-poor divide, consumers are increasingly conscious of their dining choices. They want the food to be reasonably cheap yet aligned with their health priorities, a gap being filled by fast-casual restaurants. The National Restaurant Association is forecasting that industry sales will grow 3.6% to reach $683 billion in 2014. However, this growth is unlikely to be shared equally among all restaurant segments. According to research by The NPD Group, fast casual was the only restaurant segment to record increased foot traffic in 2013, with 8% growth in customer visits. This statistic is hardly surprising if you consider how much the purchasing power of the middle class has eroded. People in the bottom 80% of the income bracket accounted for 39% of personal-consumption spending in 2012 compared with a ratio of 46.6% two decades ago, based on a study by the Institute for New Economic Thinking. Noodles & Company (NASDAQ:NDLS), a chain of fast-casual restaurants serving noodles and pasta, is well positioned to benefit from these trends. Consumer spending at fast-casual restaurants grew by 10% in 2013 compared with a 2% industry growth rate. There are a few key differences between fast casual and casual dining, which account for the higher growth trajectory of the former. Firstly, dinner is typically the major sales contributor for casual-dining restaurants; fast-casual restaurants have greater diversification with respect to dayparts. For example, Noodles & Company has an equal sales split between lunch and dinner. Secondly, fast-casual restaurants are generally focused on higher-quality food offerings than their casual-dining counterparts. Thirdly, the price points for fast-casual restaurants are lower. Based on research by NPD, the average check size at fast-casual restaurants was $7.40 in 2013 versus $13.66 and $5.30 for full-service restaurants and quick-service restaurants (QSRs), respectively. Similar characteristics, such as higher-quality food offerings and lower price points, can be seen at Noodles & Company and are discussed in greater detail below. As industry data indicates, consumers are willing to pay more for higher-quality food offered at fast-casual restaurants (relative to QSRs). More importantly, while QSRs are cheaper, they are also relatively less healthy in general, potentially contributing to health problems and expensive medical bills in the future. Noodles & Company has the best interests of consumers in mind when it comes to the menu. In general, all of its food items are free of MSG and trans fats, and Noodles & Company has a variety of serving sizes tailored to customer needs, such as its '500 calories or less' menu options. For vegetarians, Noodles & Company offers 14 fresh vegetables and organic tofu on the menu. Those suffering from a gluten intolerance will be pleased to know that Noodles & Company can prepare dishes with gluten-free ingredients for them. Accolades from the industry speak for themselves. 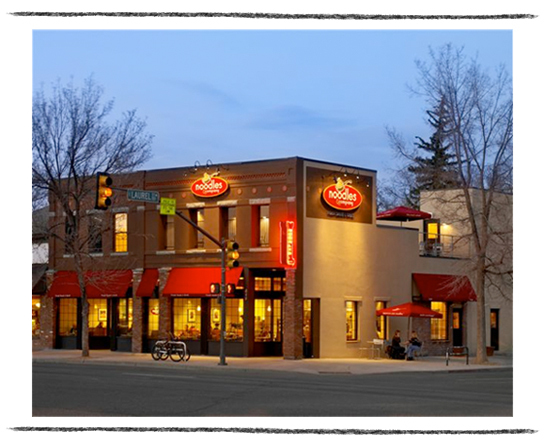 Noodles & Company was ranked among the top 10 best family restaurants by Parent Magazine in 2011 and 2009 based on the healthfulness and quality of ingredients of food offerings. To have a better understanding of consumer preferences for organic and natural foods, look no further than WhiteWave Foods (NYSE:WWAV), a manufacturer of plant-based foods and beverages, premium dairy products, and organic greens and produce. Based on its internal estimates, WhiteWave has been the fastest-growing food and beverage company in the U.S. over the past few years. Its four-year compound annual growth rate of 9.7% puts it ahead of other food giants including Hershey and Danone. Strong consumer demand for such quality products is the key driver of WhiteWave's industry-leading growth rate. According to Nielsen, the U.S. organic packaged salad and plant-based food and beverage markets grew by approximately 17% and 16% annually from 2011 to 2013. Noodles' menu items are competitively priced, with its customers spending an average of $8 per visit. Value pricing is as much about value as it is about price. Noodles & Company competes with other casual-dining restaurants by offering the same value proposition for much less. For example, while many restaurants have increased the usage of food- processing equipment to automate the cooking process, Noodles & Company still relies on more traditional labor-intensive methods such as hand-chopping, sauteing, and par boiling. It also doesn't compromise on service, encouraging its staff to actively interact with customers. Noodles & Company's restaurant managers are even empowered to organize appreciation days and food tastings for individuals and organizations of the local community. When Noodles & Company's customers compare the 'value' they get with the price they are paying, they become satisfied, loyal fans. Another restaurant operator that has employed the value-pricing strategy is Brinker International (NYSE:EAT) with its everyday value strategy. At Chili's, Brinker offers a $20 dinner complete with two full-size entrees and an appetizer, and $6-$8 lunch combos where customers can have their choice of sandwiches, bites, and quesadillas. For Maggiano's, Marco's Meal for Two delivers a three-course meal served with two classic pastas and one freshly made dessert; while there is a buy one, get one free offer for nine of its Classic Pastas. Brinker's financial results are the best evidence for the success of its value-pricing strategy. It recorded its 14th consecutive quarter of earnings growth in the fiscal second quarter. Customers have scored Brinker's restaurants well on the value dimension based on the company's internal surveys. 'More for less' best describes the attractiveness of fast-casual restaurants like Noodles & Company. Going forward, Noodles & Company stands to benefit as health-conscious consumers upgrade from QSRs to fast-casual restaurants (for higher-quality food offerings) and the sandwiched middle class downgrades to fast-casual restaurants because of decreased purchasing power.